Step back in time aboard Independence Seaport Museum's Spanish-American War flagship -- the Cruiser Olympia! also served her country during World War I. Cruiser Olympia was decommissioned in 1922 and has been part of Independence Seaport Museum’s Historic Ship Zone since 1996. Olympia is a National Historic Landmark, a National Historic Mechanical Engineering Landmark, is on the National Register of Historic Places, and is part of the Save America’s Treasures program. USS Olympia (C-6/CA-15/CL-15/IX-40) is a protected cruiser which saw service in the United States Navy from her commissioning in 1895 until 1922. This vessel became famous as the flagship of Commodore George Dewey at the Battle of Manila Bay during the Spanish-American War in 1898. The ship was decommissioned after returning to the United States in 1899, but was returned to active service in 1902.She served until World War I as a training ship for naval cadets and as a floating barracks in Charleston, South Carolina. 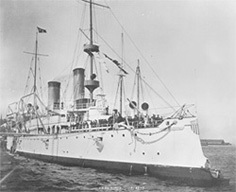 In 1917, she was mobilized again for war service, patrolling the American coast and escorting transport ships.Following the end of World War I, Olympia participated in the Allied intervention in the Russian Civil War in 1919, and conducted cruises in the Mediterranean and Adriatic Seas to promote peace in the unstable Balkan countries. In 1921, the ship carried the remains of the First World War's Unknown Soldier from France to Washington, DC, where his body was interred in Arlington National Cemetery. Olympia was decommissioned for the last time in December 1922 and placed in reserve.In 1957 the US Navy ceded title to the Cruiser Olympia Association, which restored the ship to its 1898 configuration. 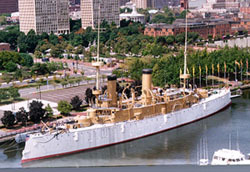 Since then Olympia has been a museum ship in Philadelphia Pennsylvania, which now part of the Independence Seaport Museum. It is the oldest steel warship still afloat. However, the Museum, has been unable to fund essential maintenance for the old ship, and attempts to secure outside funding have failed. BackgroundWhen the first Cleveland Administration came to power in 1885, United States Secretary of the Navy William Collins Whitney, continued the naval modernization program started during the previous Arthur Administration. 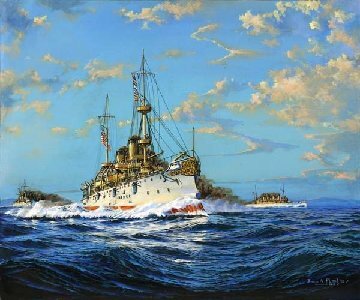 U.S. naval policy at this time was focused on commerce raiding, which implied a defensive role on the part of the United States.In 1887, Whitney authorized the construction of two coastal defense battleships, which were to become Texas and Maine. The emphasis was still primarily on large and fast commerce raiding cruisers, capable of destroying an attacking fleet's supply line. President Grover Cleveland was defeated in the election of 1888, but before he left office, Whitney managed to have Congress authorize two additional cruisers. One of these was a large, 5,300-ton protected cruiser, which was to become Olympia.Starting in 1887, the new Secretary of the Navy, Benjamin Tracy, began to rethink naval policy. Although Tracy allowed the design and construction of Olympia to continue, he was a follower of Alfred Thayer Mahan. As such, Tracy advocated a battle fleet capable of engaging enemy fleets in their home waters. This meant a move away from large, fast, commerce-raiding cruisers. As a result, Olympia, which would probably have been the first in a large class of ships, was the only one of her type built. Design and constructionThe newly formed Board on the Design of Ships began the design process for Cruiser Number 6 in 1889. Eight inch guns were chosen as the main armament, though the number and arrangement of these weapons as well as the armor scheme were heavily debated. On 8 April 1890, the Navy solicited bids but found only one bidder, the Union Iron Works in San Francisco, California. The contract specified a cost of $1,796,000, completion by 1 April 1893, and offered a bonus for early completion .During the contract negotiations Union Iron Works was granted permission to lengthen the vessel by 10 feet (3.0 m), at no extra cost, to accommodate the propulsion system. The contract was signed on 10 July 1890, the keel was laid down on 17 June 1891, and ship was launched on 5 November 1892, However, delays in the delivery of components including the new Harvey steel armor, slowed completion. The last 1-pounder gun wasn't delivered until December 1894.Union Iron Works conducted the first round of trials on 3 November 1893; on a 68 nautical miles (126 km; 78 mi) run, the ship achieved a speed of 21.26 knots (39.37 km/h; 24.47 mph). Upon return to harbor, however, it was discovered that the keel had been fouled by sea grass, which required dry-docking to fix.By 11 December, the work had been completed and she was dispatched from San Francisco to Santa Barbara for an official speed trial. Once in the harbor, heavy fog delayed the ship for four days. On the 15th, Olympia sailed into the Santa Barbara Channel, the "chosen race-track for California-built cruisers," and began a four-hour time trial. According to the navy, she had sustained an average speed of 21.67 knots (40.13 km/h; 24.94 mph), though she reached up to 22.2 knots (41.1 km/h; 25.5 mph)—both well above the contract requirement for 20 knots. While returning to San Francisco, Olympia participated in eight experiments which tested various combinations of steering a ship by rudder and propellers. The new cruiser was ultimately commissioned on 5 February 1895. For several months afterwords, she was the largest ship ever built on the western coast of the United States, until surpassed by the battleship Oregon.Scientific American compared Olympia to the similar British Eclipse-class cruisers and the Chilean Blanco Encalada and found that the American ship held a "great superiority" over the British ships. While the Eclipses had 550 long tons (560 t) of coal, compared to Olympia's 400 long tons (410 t), the latter had nearly double the horsepower (making the ship faster), more armor, and a heavier armament on a displacement that was only 200 long tons (200 t) greater than the other. CharacteristicsThe ship is 344 feet 1 inch (104.88 m) in overall length, has a beam of 53 feet (16.2 m) and a draft of 21 feet 6 inches (6.6 m). Her design displacement was 5,865 metric tons (5,772 LT; 6,465 ST), with a full combat load of up to 6,558 metric tons (6,454 LT; 7,229 ST) displacement. The ship is powered by a pair of vertical triple expansion engines, supplied with steam from three coal-fired cylindrical boilers each. Her engines were rated at 13,500 indicated horsepower (10,100 kW) with a top speed of 20 knots (37 km/h; 23 mph), though on trials she achieved 17,313 ihp (12,910 kW) and a top speed of 21.67 knots.Olympia is armed with a variety of weapons. The primary armament is four 8 in (20 cm) 35-caliber guns in two twin Mark 6 gun turrets, one forward and one aft of the superstructure. These guns could fire 260 lb (118 kg) projectiles, either armor-piercing or high explosive, at a muzzle velocity of 2,100 feet per second (640 m/s). The Mark 6 turret was designed for depression of the guns to −4° and elevation to 13°.The secondary battery is ten 5-inch (13 cm) 40-caliber guns mounted in casemates, five on each side of the ship; each is placed to avoid the flash from the main battery. These guns fired 50 lb (22.7 kg) armor-piercing shells at a muzzle velocity of 2,300 f/s (701 m/s). Fourteen 6-pounder anti-torpedo boat guns are mounted in casemates. Six 1-pounder guns are mounted on deck, along with six 18 in (46 cm) above-water torpedo tubes.Olympia's conning tower is armored with 5 in (130 mm) thick steel plates. The ship has a 2-inch (51 mm) thick armored deck that slopes on the sides; the slopes increase in thickness to 4.75 in (121 mm) amidships and 3 in (76 mm) at the ends. A 4-inch (100 mm) thick glacis protects the engine rooms. Her main battery turrets are protected by 3.5 in (89 mm) of Harvey armor, while the barbettes upon which they rest have 4.5 inches (110 mm) thick nickel-steel armor. The 5-inch guns are protected by 4-inch thick gun shields.Olympia's crew numbered between 411 and 447 officers and enlisted men. Service historyUpon commissioning in February 1895, Olympia departed the Union Iron Works yard in San Francisco and steamed inland to the US Navy's Mare Island Naval Shipyard at Vallejo, where outfitting was completed and Captain John J. Read was placed in command. In April, the ship steamed south to Santa Barbara to participate in a festival. The ship's crew also conducted landing drills in Sausalito and Santa Cruz that month. On 20 April, the ship conducted its first gunnery practice, during which one of the ship's gunners, Coxswain John Johnson, was killed in an accident with one of the 5 inch guns. The ship's last shakedown cruise took place on 27 July. After returning to Mare Island, the ship was assigned to replace Baltimore as the flagship of the Asiatic Squadron.On 25 August 1895, the ship departed the United States for Chinese waters. A week later, the ship arrived in Hawaii, where she remained until 23 October due to an outbreak of cholera. The ship then sailed for Yokohama, Japan, where she arrived on 9 November. On 15 November, Baltimore arrived in Yokohama from Shanghai, China, to transfer command of the Asiatic Squadron to Olympia. Baltimore departed on 3 December; Rear Admiral F.V. McNair arrived fifteen days later to take command of the squadron. The following two years were filled with training exercises with the other members of the Asiatic Squadron, and goodwill visits to various ports in Asia. On 3 January 1898, Commodore George Dewey raised his flag on Olympia and assumed command of the squadron.Spanish-American WarAs tensions increased and war with Spain became more probable, Olympia remained at Hong Kong and was prepared for action. When war was declared on 25 April 1898, Dewey moved his ships to Mirs Bay, China. Two days later, the Navy Department ordered the Squadron to Manila in the Philippines, where a significant Spanish naval force protected the harbor. 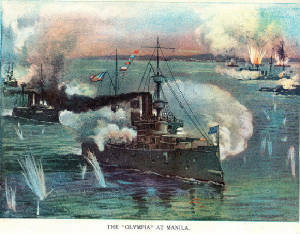 Dewey was ordered to sink or capture the Spanish warships, opening the way for a subsequent conquest by US forces.\Olympia at the Battle of Manila Bay.On the morning of 1 May 1898, Commodore Dewey, with his flag aboard Olympia, steamed his ships into Manila Bay to confront the Spanish flotilla commanded by Rear Admiral Patricio Montojo y Pasarón. The Spanish ships were anchored close to shore, under the protection of coastal artillery, but both the ships and shore batteries were outdated. At approximately 05:40, Dewey instructed Olympia's captain, "You may fire when you are ready, Gridley". Gridley ordered the forward 8-inch gun turret, commanded by Gunners Mate Adolph Nilsson, to open fire, which opened the battle and prompted the other American warships to begin firing.Though shooting was poor from both sides, the Spanish gunners were even less prepared than the Americans. As a result, the battle quickly became one-sided. After initial success, Dewey briefly broke off the engagement at around 07:30 when his flagship ran low on 5 inch ammunition. This turned out to be an erroneous report - the 5-inch magazines were still mostly full. He ordered the battle resumed shortly after 11:15. 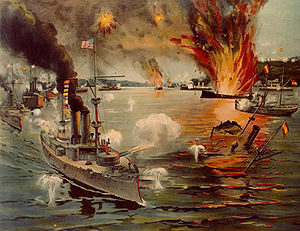 By early afternoon, Dewey had completed the destruction of Montojo's squadron and the shore batteries, while his own ships were largely undamaged. Dewey anchored his ships off Manila and accepted the surrender of the city.Word of Dewey's victory quickly reached the United States; both he and Olympia became famous as the first victors of the war. An expeditionary force was assembled and sent to complete the conquest of the Philippines. Olympia remained in the area and supported the Army by shelling Spanish forces on land. She returned to the Chinese coast on 20 May 1899. She remained there until the following month, when she departed for the United States, via the Suez Canal and the Mediterranean Sea. The ship arrived in Boston on 10 October. Following Olympia's return to the United States, her officers and crews were feted and she was herself repainted and adorned with a gilded bow ornament. On 9 November, Olympia was decommissioned and placed in reserve. Post-war serviceOlympia was recommissioned into the fleet in January 1902 and assigned to the North Atlantic Squadron. Her first duty was to serve as the flagship of the Caribbean Division. Over the following four years, the ship patrolled the Atlantic and Mediterranean; her voyages included a visit to Turkey. Starting on 2 April 1906, she became a training ship for naval cadets from the United States Naval Academy. In this role, she conducted three summer training cruises: 15 May – 26 August 1907, 1 June – 1 September 1908, and 14 May – 28 August 1909. Between the cruises, the ship was placed in reserve, first in Norfolk, Virginia and later at Annapolis, Maryland. On 6 March 1912, Olympia arrived in Charleston, South Carolina. Here she served as a barracks ship until 1916. In late 1916, the ship was recommissioned into the fleet, when it became increasingly clear that the United States would eventually join the fighting in World War I.World War IAfter the United States joined World War I in April 1917, Olympia was mobilized as the flagship of the US Patrol Force. She was tasked with patrolling the eastern seaboard of the United States for German warships. She also escorted transport ships in the North Atlantic. On June 15, 1917 she ran aground on Long Island Sound, and was put in for repairs at the Brooklyn Navy Yard, which, along with the replacement of her four inch guns with five inch guns, took eight months. Olympia departed Charleston on 28 April 1918 carrying an expeditionary force bound for Russia. Russia, which had previously been a member of the Allied Powers, was in the midst of civil war and had signed a separate peace with Germany. On 9 June 1918, the ship arrived in Murmansk, Russia, and deployed the peace-keeping force. She subsequently assisted in the occupation of Archangel.After the end of the war, Olympia sailed to the Mediterranean via Portsmouth, England. In December 1918, the ship became the flagship for American naval forces stationed in the eastern Mediterranean Sea. While on this assignment, she continued in her old role of showing the flag and conducting goodwill visits in various Mediterranean ports. This included a period of policing duty in the Adriatic Sea from 21 January to 25 October 1919; the Dalmatian coast was in a state of turmoil following the collapse of the Austro-Hungarian Empire at the end of the war. On 18 August she steamed to the Black Sea to aid the return of refugees from the Balkans who had fled during the war. She was back in the Adriatic by 19 September, and four days later had to deploy a landing party to prevent an incident between Italian and Yugoslav forces.Olympia briefly returned to Charleston on 24 November 1919. The following year she was reclassified as CA-15. She then prepared for another tour of duty in the Adriatic, departing from New York on 14 February 1920. This was concluded on 25 May 1921, when the ship returned to Charleston. A month after her arrival she was made the flagship of the training unit for the Atlantic Fleet. She then participated in the joint Army-Navy experiments in July, during which the ex-German warships Ostfriesland and Frankfurt were sunk off the Virginia Capes. She was again reclassified as CL-15 that year.On 3 October 1921 Olympia departed Philadelphia for Le Havre, France, to bring the remains of the Unknown Soldier home for interment in Arlington National Cemetery. The cruiser departed France on 25 October 1921; she was escorted by a group of French destroyers for part of the voyage. At the mouth of the Potomac river on 9 November, the battleship North Dakota and the destroyer Bernadou joined Olympia as she sailed to the Washington Navy Yard. After transferring the remains to shore, Olympia fired her guns in salute. Olympia conducted a last training cruise for midshipmen in the summer of 1922.Preservation of OlympiaOn 9 December 1922, she was decommissioned for the last time in Philadelphia and placed in reserve. On 30 June 1931, the ship was reclassified as IX-40., to be preserved as a relic.On 11 September 1957, she was released to the Cruiser Olympia Association, modified back to her 1898 configuration and became a museum ship under their auspices. In January 1996, when faced with mounting debt and tremendous deferred maintenances, the Cruiser Olympia Society merged with the Independence Seaport Museum in Philadelphia, Pennsylvania. TO VOLUNTEER, HELP OR DONATE TO SAVE THIS GREAT SHIP FROM DESTRUCTION, CLICK ON THE PICTURE ABOVE. GO TO TCOHS.ORG TO HELP OR DONATE!